Reinhart kicked-off our 17th Annual Coat Drive today with the goal of collecting more than 1,500 adult and children’s winter coats to distribute to local agencies throughout Washtenaw County. Through the month of November, we will be collecting new and gently used winter coats at all of the Charles Reinhart Sales Offices as well as all Sunday Open Houses. 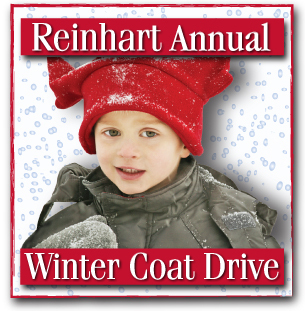 Over our 16-year history, Reinhart has collected more than 16,000 coats, all of which have been donated to agencies in our community. The need for winter coats, especially for children, continues to be great. The 17th Annual Coat Drive hopes to help fill that need in our community as the weather begins to get colder. For more information about the 17th Annual Coat Drive, please contact Megan Crosbie, Marketing Coordinator at 734-669-5906 or mcrosbie@reinhartrealtors.com. As Marketing Coordinator for the Charles Reinhart Company, Megan Crosbie is primarily responsible for their online presence, including the social media strategy, website and blog.